There are 18 comments for this item. Gawd, I'm old enough to remember the old-school Mickey-Dees when all they had was walk-up windows. Back the 60s, IIRC, the food was excellently well made. But now they've gone downhill ever since. Ah! Those were the days when Mc-Dees made quality food for a pittance. And whatever happened to "fresh, never frozen"
Henry, the fries started out at 12 cents ... I remember waiting for the neighbor lady to return from lunch at the first McDonald's in Akron - her comment was "that was the worst lunch I ever had"
I enjoy reading the great posts about McDonald's: mine relates to the spring/summer of 1977. My dad and I visiting McD's and he asking me if I wanted not one "Big Mac" but, would I like TWO (? ): I was a typical 14 year old. If memory serves each burger was "75 cents." I learned over the years this location was the very first McDonald's every built in my city, and it is still there today. I can't recall the last time I walked into their restaurant. I rode in my first VW Beetle and ate my first Mickey-D burger on the same day in 1961, what a day! The Azusa. Ca MDs was across the street from the drive-in. One night a week they had 10 for a dollar. what a deal. we'd load up and head over to watch the movie. I came from a very small rural town in Southeastern Colorado. McDonald's never even came to our region until around 1970. Unfortunately, I lived 40 miles from it, so never ate there except once every two months. To this day, we still don't have McDonald's in my town which has gotten even smaller than back in the day. I have nothing against McDonald's now. The meat is still the same meat it always was (check with your local health inspector if you don't believe me), but it is frozen. Back when it was ground in the store (Wendy's still does this) there were some problems with foreign matter getting into the meat. It was a simpler time when these pictures were taken and the problems were often overlooked. We looked at McDonald's as a treat rather than a daily habit. We rode our bicycles 3 miles to play handball and then pedaled another 3 miles to McDonald's on Merrick Blvd. (Laurelton,Queens). We would get 2 burgers, fries and a thick shake and sit on the tiled bench seat outside (no seats indoors). It was the late 1960's and the total was about $1.08 if I remember. Then it was 6 miles home on my stingray bike. Those days were great ! I'm deleting my old comments as we go. If you'd like you can email direct to john@homeisp.com. Small world. My youngest was born in SB, and after college moved to Indy. Still owns a home there, but now lives in Wyoming. We went to the zoo in SB quite often, but we lived just off Portage and Elwood. My wife's office was on Ironwood, and mine too after a while. I recall the MacD's just across from Memorial Hospital. 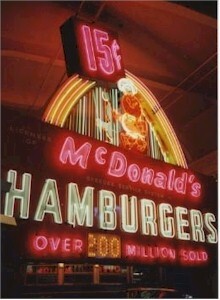 An early radio commercial touted McDonalds' 15-cent hamburgers, 15-cent fries, and 15-cent drinks. It went, in part: "Forty-five cents for a three course meal? / Sounds to me like that's a steal! / That's all it costs to eat here, every day / Drive out to McDonald's Drive-In right away." Being in the Navy at the time (making little money), it was a way to take a date out and have a good time. We all went to McD's in the Bay Area, Calif in the early 60's. At that time they were the best tasting for practically nothing. 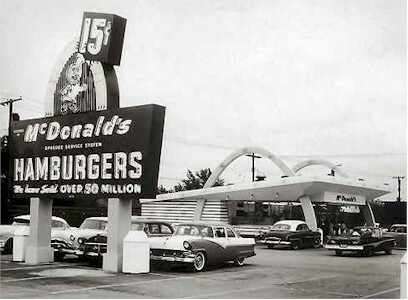 As a kid we had a McDonalds in Virginia Beach, VA in the early 60's--why did everything taste so much better then? Had one in Jacksonville, FL, in the 60's. Walkup only, no drive through, no dining room. Some outdoor tables, but that was all. Even then they had the best fries around. Then moved to N. Indiana, and got to see the original McDonald's in Des Plaines, IL. I remember an early McDonald's just like this one which came to Newark, Delaware, in the late 1950's.